Our PatriARTic event was created in 1998 when committee members were searching for a new way to fundraise for Arts Visalia and honor the people who support us. Lynne Dwelle, a major supporter and current board member of Arts Visalia, came up with the idea for our PatriARTic event, and we decided to hold it near Flag Day. 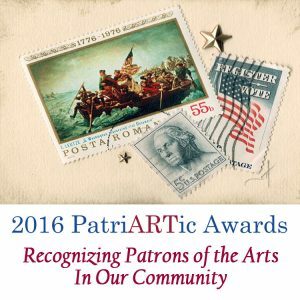 The PatriARTic event was created to honor the educators, organizations, artists, supporters, and volunteers in our community who support the arts. The event is an informal dinner and awards ceremony which features a barbecue, drinks and desserts. If you would like to make reservations for this year’s event, you may purchase tickets at Arts Visalia 214 E. Oak Ave.
Over the years, we have recognized the contributions of many who have contributed to the arts in our valley. These are people who have given so much, whose talents and generosity enhance our arts community in countless ways. It was held on Monday evening, June 13th, 2016, at the beautiful home of Carol and Stan Trapp. The early evening event included a barbecue dinner served by the Sunset Lion’s Club, art displays by the recognized artists, raffle prizes, live music and, of course, the honoring of these exceptional people. Tickets were priced at $35.00 with tables available for reservation. Our next PatriARTic awards dinner will be held in 2018. Check back here or call the gallery, 739-0905, for more information. The PatriARTic event was created to honor the educators, organizations, artists, supporters, and volunteers in our community who support the arts. The event is an informal dinner and awards ceremony which features a barbecue, drinks and desserts. If you would like to make reservations for this year’s event, you may purchase tickets at the gallery or by calling (559) 739-0905.